The region was named after the village with 4,669 inhabitants west of Buda Mountains. According to finds it was already inhabited in the paleolithic age, important Celtic, Roman and Avar relics were also found. In the 1050s it already had a stone church which was extended in the following century. 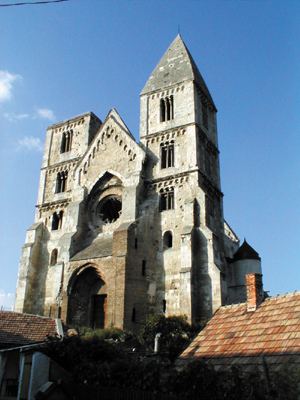 The Romanesque-Gothic Premonstratensian three-aisled provost basilica was built around 1220. 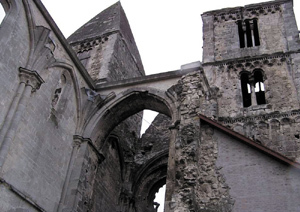 It was severely damaged by the earthquake in 1773, since that time it has been in ruins. After 17 years the inner part of the church can be visited, too. It has been closed for visitors so far. 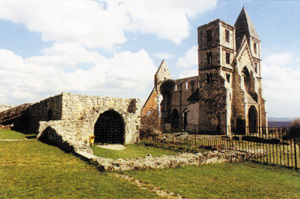 The adjacent monastery was rebuilt in Gothic style in the 15th century. In 1467 it got the rank of a market town from King Matthias. The 15th century castle was owned by Matthias's son, János. In the 1710s the Zichy family converted it into a two-storeyed, early Baroque castle decorated with corner turrets. At present it houses the Apor Vilmos Teacher Training College. Interesting architectural relic of the 145-year Turkish rule is the Turkish well. The Zichy family settled "hajdú" soldiers from the border castles and Germans in the village. Special architectural relics of the age: the rebuilt castle, the Baroque chapel which commemorates of the plague of 1737-39, the plague statue opposite the castle, the beautiful Baroque parish-church built between 1749 and 1752, the two-storeyed school with sun-dial from 1791, the peasant house with the relief of Saint Vendel in which a collection of painted ethnic German peasant furniture can be found. 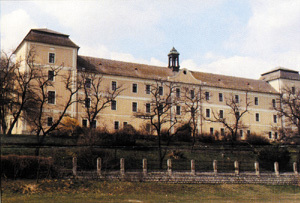 The order of the Sisters of the Cross got the castle in the 19th century, they rebuilt it and added the Josephinus home of old sisters and the cloister's garden. The lamp museum is famous all over Europe. Zsámbék is an important cultural centre. The Zsámbéki Szombatok (Zsámbék Saturdays) has been a significant cultural festival since 1983. The Zsámbék Open Air Theatre was founded in 1995.